On episode 52 of Longest War: The Post-9/11 Veterans Podcast, we talk to former Air Force EOD officer and bestselling author Brian Castner about classified rumors, being EOD cool, the evolution of IEDs, American ego, and acceptance of violence and grief. 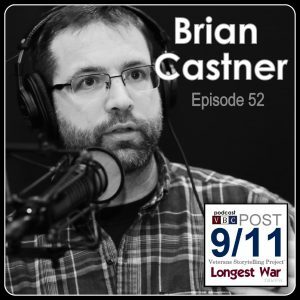 Brian Castner is former Air Force explosive ordnance disposal officer and combat veteran of the Iraq War. He is a noted author, appearing in the New York Times, WIRED, Esquire, The Atlantic, Foreign Policy, and on National Public Radio. He is most noted for his war memoir, The Long Walk, which was adapted into an opera and named a New York Times Editor’s Pick and an Amazon Best Book. His other works include Disappointment River, and All the Ways We Kill and Die. This episode was recorded January 24, 2018 in Pittsburgh, Pennsylvania. Host: Nick Grimes. Guest: Brian Castner. Audiography: Kevin Farkas/The Social Voice Project. Music (available on SoundCloud.com): Delta Notch (“Ellie’s Song”), Pipe Choir Records (“The Interesting Actual”), Paul Paik (“Mood Indigo”). ©Longest War: The Post-9/11 Veterans Podcast. Veterans Breakfast Club. All rights reserved.